I graduated from Brunel University in ’08 with a degree in Industrial Design and Technology. I exhibited my mechatronics project “Digimech Clock” at the graduation show, which landed me my first design consulting job at KD in Bristol. 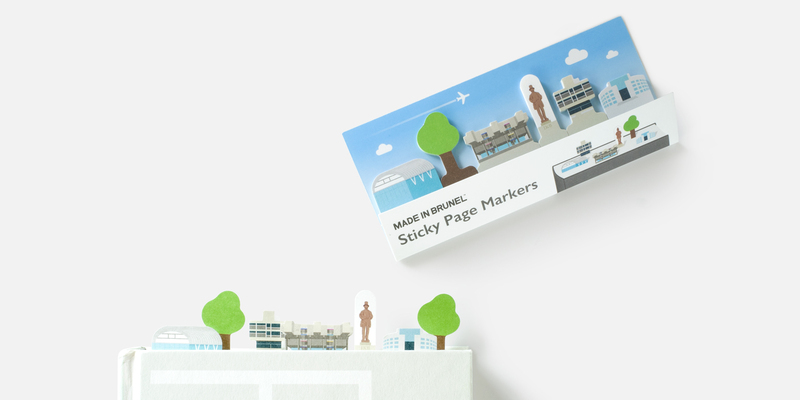 Last year, the Brunel marketing department asked if I could design and produce a customised version of my Sticky Page Markers that they could use as promotional gifts during their 50th anniversary celebrations. It was a real honour to be asked. • The indoor athletics centre. • The lecture centre (the brutalist architecture was used as the set for the “Ludovico Medical Facility” in “A Clockwork Orange“). • The statue of Isambard Kingdom Brunel, which was erected in the centre of campus during my study term. • Tower A (this is where fellow design graduates and myself spent most time in the workshops, hoping araldite will fix everything). • The Eastern Gateway building. • A tree for good colour balance, and an airplane on the custom-printed packaging, referencing Brunel’s easy access to Heathrow airport. We hope students, alumni, visitors and supporters of Brunel will enjoy creating miniature diorama of the campus whilst marking the pages of their books, catalogs and documents. Maybe they’ll even try mixing them up with markers from other packs. If you’re interested in printing high-quality, custom sticky page markers for your event or promotion, please get in touch. (minimum order of 1,080 units).